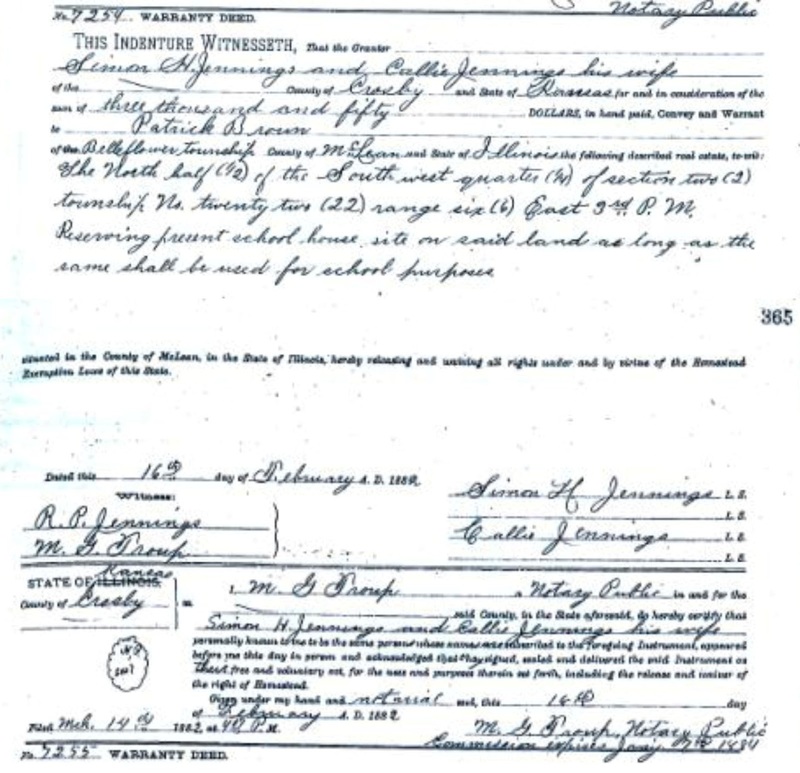 In the last post, we looked at Patrick Brown, the oldest child of Timothy and Hannah Kelly Brown while he lived in Ohio. In this post, we will continue to follow the story of Patrick. wife, Anne Burns, and six children, ages one to eleven, are living in McLean County, Illinois. 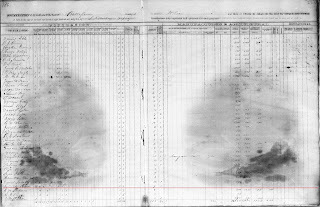 The Illinois State Census for Bellflower Township in McLean County for 18652, (see image right), names ﻿﻿﻿﻿heads of households, and provides values of agricultural activities for each person enumerated. 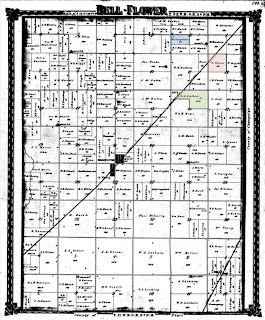 All persons enumerated in the district, except Patrick, show farm activity, perhaps, indicating that Patrick was a recent arrival to the community. Bloomington Moraine.3 The glacial left an unbroken prairie with a deep layer of top soil over a gravel bed with virtually no trees making it very desirable farm land. In fact, Belleflower has been identified as the “finest township of land in the State; and perhaps, the finest in any State.”4 It is easy to see why this area was appealing to a farmer like Patrick. John, joined the family. Brother John died in 1873 as the result of a train accident. 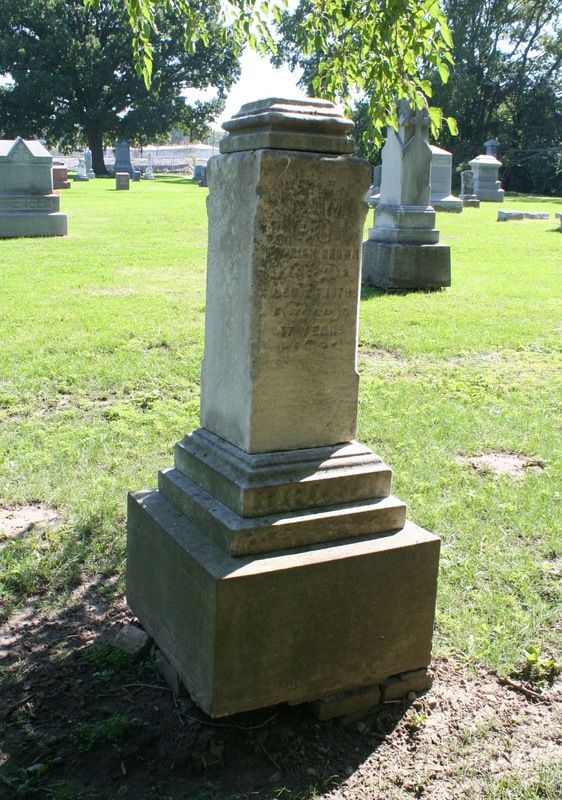 John’s wife, Ellen, a sister of Patrick’s wife, Ann, died in 1878. (More about Johanna Brown Roach and John Brown in future posts.) 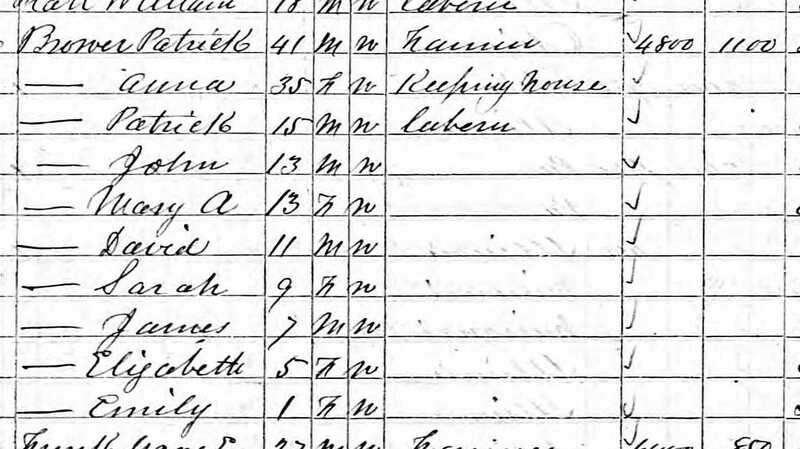 The 1870 and 1880 US Census records10 show the members of the family living with Patrick during those years. Just as any family grows, the members also mature and leave home to create lives of their own. The first of the children to leave home was Patrick when he married Ann Radigan in January 1880. The oldest daughter, Mary Ann, married James Cox in January 1881. Two other daughters, Sarah and Elizabeth married in 1884. Two additional sons, John B. and David O. left for Nebraska sometime around 1883. But, probably the most devastating change for Patrick was the death of his wife, Ann, on December 24, 1878 at the age of just 47. Ann’s sister, Ellen had died of cancer in Columbus, Ohio in April, 1878. Patrick had gone to Columbus to assist his brother’s family and returned with one of the children, William H. How tragic that Ann, too, would have been taken by cancer in the same year. This is probably about the time Patrick left Illinois. Patrick had lived in McLean County about twenty years. His family was dwindling, his wife and mother were gone, the children were setting out on their own, getting married or moving to other states. Patrick likely felt a need to do something different; and, so he subsequently moved to Nebraska with two of his sons. That is where we will pick up the story of Patrick Brown in the next post. 1. Brown, David Earl, Kewanee, IL, 11 May 1943, Letter to Esther _____, Columbus, OH. 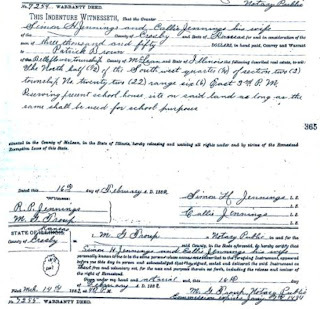 Letter contains genealogical information for the Brown Family from County Limerick. 5. McLean Co, IL, Deed Book, Book 85, page 215. Ira Colby, Emma Colby, Ceiclia Roberts, Samuel Roberts to Patrick Brown for $4,680 dated 30 Aug 1869. There was a mortgage recorded for this property. 6. 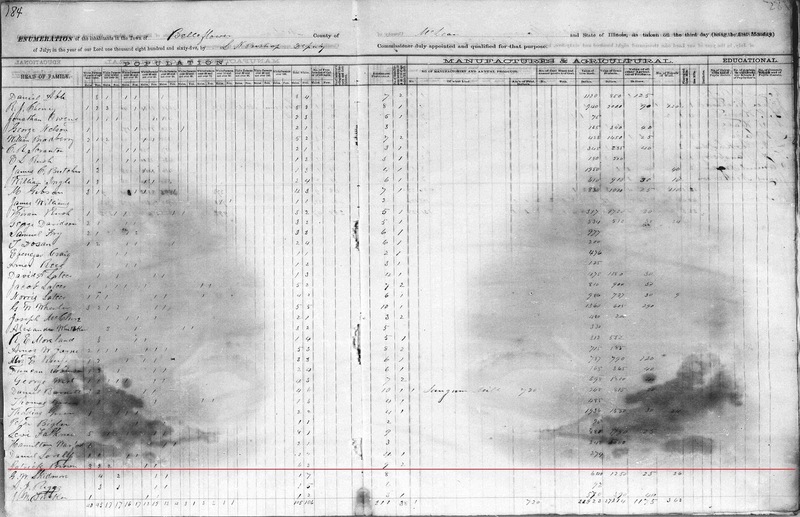 McLean Co., IL, Deed Book, Book 113, page 364. Patrick Brown and Ann Brown to Ira Colby for $5,600 dated 11 May 1878. The original mortgage was released. 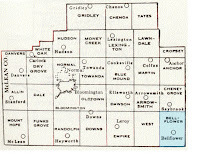 McLean Co., IL, Deed Book, Book 108, page 480. Lucinda G. Bent to Patrick Brown for $5,000 dated 5 Feb 1878. A mortgage was also recorded on this property. 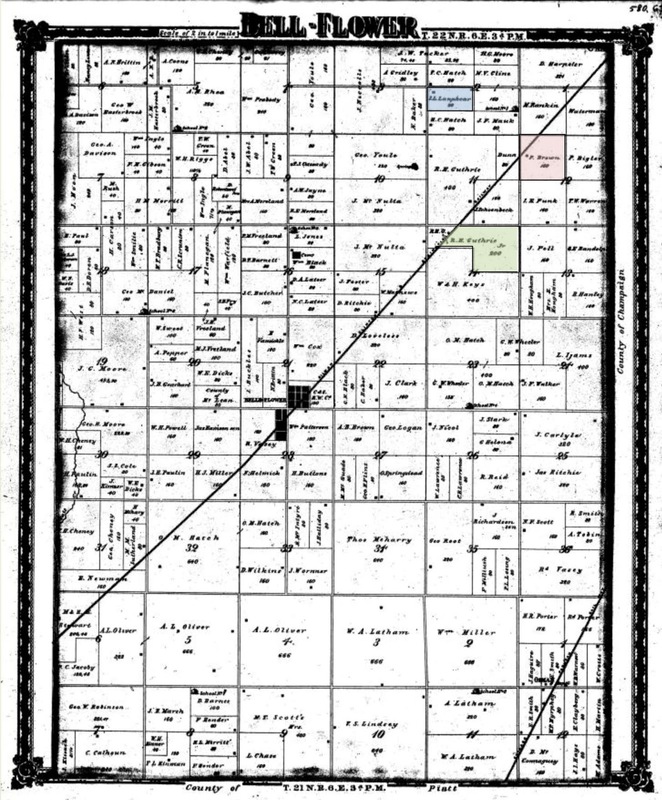 McLean Co., IL, Deed Book, Book 126, page 364. S.H. Jennings to Patrick Brown for $3,050 dated 16 Feb 1882. Mortgage to Martha Smith for $1,600. 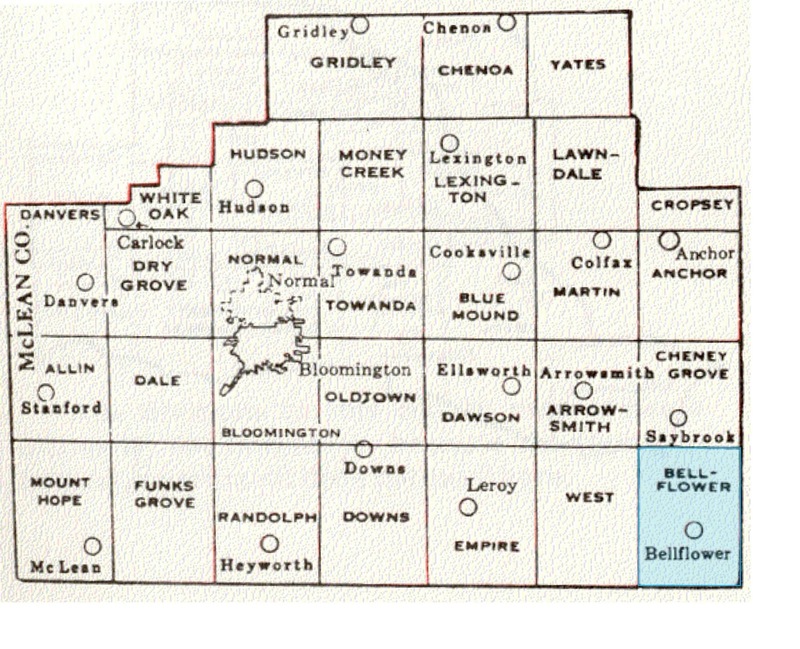 McLean Co., IL, Deed Book, Book 145, page 107. Patrick Brown, widower, to Eli Woodfor $3,200 dated 7 Feb 1887. 11. 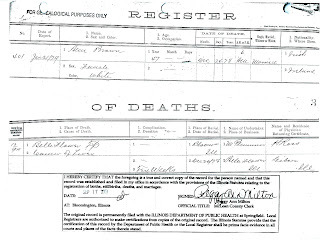 Death Register, Ann Brown, died 24 Dec 1878, County Cerk’s Office, McLean County, IL, accessed 17 Sep 2009, Bloomington, McLean, IL. 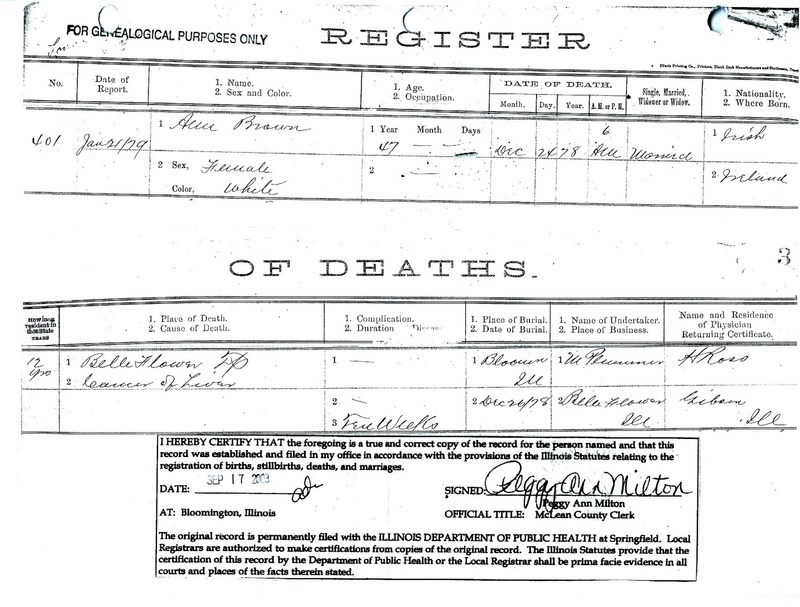 Death notification for McLean County, Illinois was not mandatory until 1916. Some random death certificates do exist before that time. Photo from Find-A-Grave. The tombstone is quite large, over five feet tall. 12. “Rough on Railroads, The Polar Wave - How its Breakers Affected the People and the Lines.” The Pantagraph, Bloomington, IL. Available online through Newspapers.com. 13. The Pantagraph, the local Bloomington newspaper, carried news of not only Bloomington, but, the surrounding communities and, indeed, around the world. Notices of the information given above were from various editions dating from 1876 to 1883. In September 1881, a news items from Dublin, Ireland was included telling a story about the Brown’s home place in County Limerick. “DUBLIN, September 14 – In a railway accident at Patrick’s Well, County Limerick, fifty persons were injured.” I can only imagine their reaction to that information. The following story was printed on page three of the February 10, 1876 copy. “A man named Patrick Brown was struck by the pilot [what we call a ‘cow catcher’] of an engine on a train bound south, on Tuesday morning, on the Gilman, Clinton & Springfield road, near Belleflower, as he sat on the ties. He was probably drunk. His skull was fractured and he was injured internally, and will doubtless die.” The track runs directly through Patrick’s property in section 12 (the red section of the map). Obviously, Patrick did not die, but, after the death of his brother, John, in 1873 from a train accident, he really should have known better than to sit on the track. The paper made no further mention of the accident, his injuries, or his recovery. Once again, I am so impressed with the variety of sources and the citations. I aspire to be you. Thank-you Mary Ann for your excellent work. I enjoyed this and appreciate your dedicated, competent work. Thanks for sharing with us. I am so happy to have found your blog! 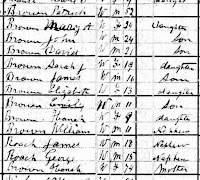 Patrick Brown and Annie Radigan are my great-great grandparents and while I've come across much of this info before in my own ancestry search, your details are fantastic. I look forward to reading more. Thanks! Thanks for this blog! 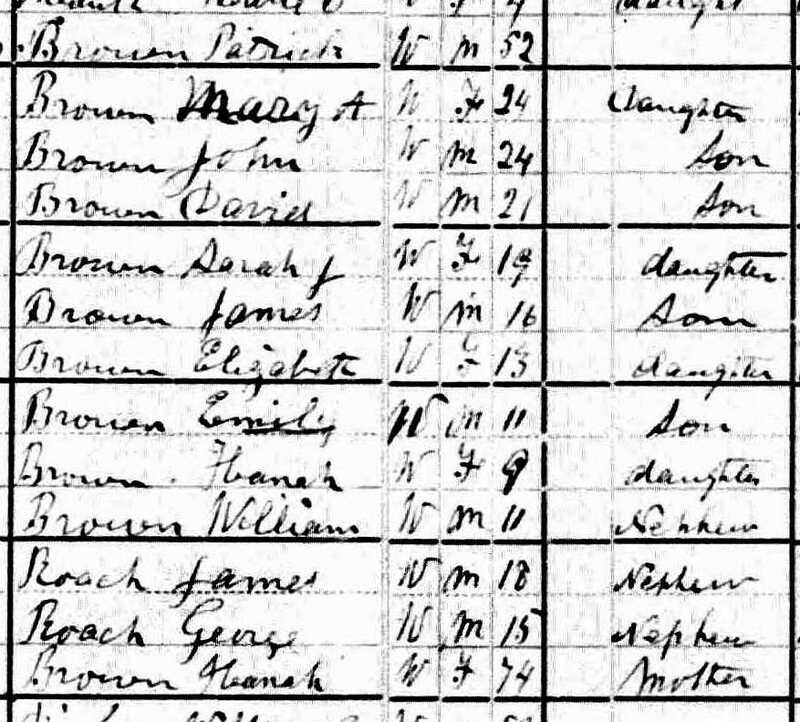 Patrick Brown and Annie Radigan are my great-great grandparents and while I've come across much of this info in my own search, you have filled in many gaps and provided a lot of great detail/sources. I look forward to your next post! Bridget, thanks for coming to the blog! Sorry for the delay in responding - we have been on vacation. I do have some additional interesting information for Patrick that will be published in the next installment. I'd love to hear your information about Patrick and family also! Please respond at stillsearching@gmail.com.